A troubled young man runs away to Mexico, where he is recruited to join a paramilitary group of teens fighting the drug cartels. Isolated in the desert, he proves himself by becoming The Captain’s top soldier, but questions the group’s true purpose. As the Mexican police close in, he realizes that his only way out is to escape back to America, but first he must outwit The Captain. Every descendant of a famous person struggles with the same problems. They all have to prove themselves real hard, so they aren’t referred to as “son of” or “daughter of”. The prejudices that everything is served on a silver platter for them and thanks to their famous father and mother the path to success is without obstacles, is difficult to avoid. I guess Scott Eastwood (indeed “son of”) knows what I mean. If you take a look at his his filmography, Scott has been really active. Although most films sound unfamiliar to me (except “Diablo” which, however, I gave up watching after 10 minutes due to the old-fashioned look and the fact that I’m not really a western fan), he also succeeded in getting a part in “Suicide squad“. A movie I’m eagerly looking forward to. Time to see whether Scott can shake off the image of his über cool father. “Mercury Plains” should have gotten the alternative title “Goonies meet Sicario”. Because in essence this is just a film about a gang of scouts members (looks like it in a way) who are led by an (allegedly) charismatic, articulate leader to fight against drug gangs in Mexico. After witnessing some amateurish-looking skirmishes with local drug dealers and a raid by the police, the story evolves into a kind of survival trip in the desert. A bit like “Beyond the reach“. It’s situated at the Mexican border near the notorious Mexican citie Ciudad Juarez. 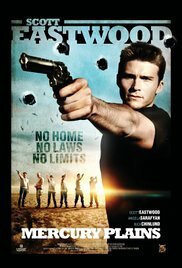 Scott Eastwood plays the unemployed, American teenager Mitch. He’s convinced by a friend to cross the border of Mexico. Thanks to his friend, Scott gets in trouble and is approached by Jesse (Justin Park) who tells him about The Captain (Nick Chinlund). I tried to be unbiased and gave Scott a chance to prove himself. But I couldn’t resist to compare him with his father. And the similarities are creepy anyway. It was as if I was looking at the young Clint again. The same facial structure and profile. The same calm and controlled expression. Also a man without many words and thoughtfully taking every possible option into consideration. Even the intonation of his voice and the controlled manner of answers are similar. Without any doubt Scott’s future looks bright. As long as the future films he’s going to play in, are from a higher level. Because in general you can say that this was an abominable bad movie, full of improbabilities and ridiculous situations. Scott’s acting was by far the best that you could admire in this movie. That’s not so hard since the rest of the cast just made a mess out of it. Maybe the age caused it. But sadly enough Chinlund wasn’t too convincing either. And Angela Sarafyan looked desirable, but her part was meaningless and pathetic. Furthermore, I was wondering the whole movie if Mitch’s step father actually wasn’t worrying about his missing SUV. Most laughable fragment was a confrontation with a known drug dealer. As told by The Captain he seemed to be guarded heavily. But I never saw a dangerous drug dealer being overpowered this easy. The guerrilla operations carried out by this group of young people against seasoned drug cartels, resembled those of old B-movies. The denouement in the sweltering desert looked considerably better, but by that time I already fought against the urge to stop watching. Hopefully Scott Eastwood goes his own way and will be offered a part in a decent film. Like the old Eastwood once said: “Improvise, Adapt and Overcome“.